Facebook could be used against you. Privacy is something that should concern everyone, yet social networking blurs the line between right and wrong. No matter how much personal information you put online, more can be gleaned from you. Just think of advertising. Very little is coincidence. However, we can’t go into conspiracy theory territory. The world probably isn’t out to get you. Nonetheless, Facebook can be utilised in some very interesting ways. An ongoing concern is a new update to the Facebook app which gives the company access to your microphone in order to identify media. Sounds like the increasingly-popular Shazam, an iOS and Android app that identifies music and TV ads, right? The two became further integrated three years ago; friends can see what each other have tagged and listen to tracks. While millions of users trust Shazam, many question if Facebook can be trusted in the same way. An online petition by Sum of Us is urging the social networking site not to roll out the update. It reached its original target of 500,000 signatures and has been extended to accommodate 750,000. Is it really a threat to our privacy? It seems not – at least, that’s what Facebook assert. It’s strictly opt-in and only turns on when writing a status update. Furthermore, it only listens in for 15 seconds, just enough time to get a fingerprint of the track it’s trying to analyse. It works in the same way as Shazam by taking an acoustic fingerprint, a digital snapshot, if you will, of any given sound. It’s been used in the music industry for a while now to determine if a particular song could be a rip-off of another. The important thing Facebook stresses is that it stores no data afterwards, and even if they did, the fingerprint can’t be reverted back to its original form so they can’t listen in. The result of the new app update is that friends can hear a 30-second preview of a song you’re listening to, or see briefly which TV show you’re watching. But many see this as a clever way of better tailoring advertisements to a users’ preferences – meaning Facebook can get even more money from companies looking into their consumers. Facebook’s been doing this sort of thing for a while, however. Your smartphone spies on you Your Smartphone Is Spying On You [GRAPHIC] Your Smartphone Is Spying On You [GRAPHIC] Read More . You may not give two-seconds’ thought to updating your status: Watching The Simpsons; Listening to The Killers; Playing Doctor Who: Legacy. And yet Facebook uses this information to get more money for advertising. Late last year, they announced that they’d send a weekly report to TV networks commenting on how many interactions shows garner. Is it really a threat to our privacy? Only as much as Twitter is. The social networking site that limits you to 140 characters is a perfect tool to talk telly, and this is Facebook’s bid to tackle that popularity. They send analyses to select US networks like CNN, ABC and Fox, but the Wall Street Journal claims “the new Facebook reports are fairly limited. They show, for example, that a recent episode of ABC’s ‘Dancing With the Stars’ generated more than 1 million interactions from some 750 thousand people.” Unlike Twitter, they supposedly don’t track what individual users think, instead compiling them into raw data reports. Once more, it boils down to one thing: the ability to command higher prices. Is The NSA Reading This Right Now? The most notable flaunt of your privacy was leaked by Edward Snowden: the National Security Agency appears to have teamed up with the UK’s secret service hub, GCHQ, to send malware to millions of homes, allowing them access to your data through an automated system (named TURBINE) – by posing as a Facebook server. Clever stuff, of course, but also wildly controversial. Is it really a threat to our privacy? TURBINE has been working since at least July 2010, and the NSA is reportedly aware that further secret service agencies across the world are copycats. So whilst the NSA claim they’re not pretending to be either Facebook or Twitter as of right now, that certainly doesn’t mean we’re not being tapped in the same way by other services. It’s a worryingly common idea: it was revealed late last month that hackers in Iran had created fake social media accounts as far back as 2011 to get information on high-level targets in various countries including the USA, UK, Syria, and Iraq. If you feel really sour over what the NSA has done, you could adopt a burner phone Sick of the NSA Tracking You? Burn Them with a Burner Phone Sick of the NSA Tracking You? Burn Them with a Burner Phone Sick of the NSA tracking you using your phone's positioning coordinates? Prepaid phones known colloquially as "burners" can provide you with partial privacy. Read More so they struggle to access your location. But if you’re of the “I’m not doing anything wrong, so why should I worry?” school of thought, you might want to try this test Could You Land A Job With The NSA? 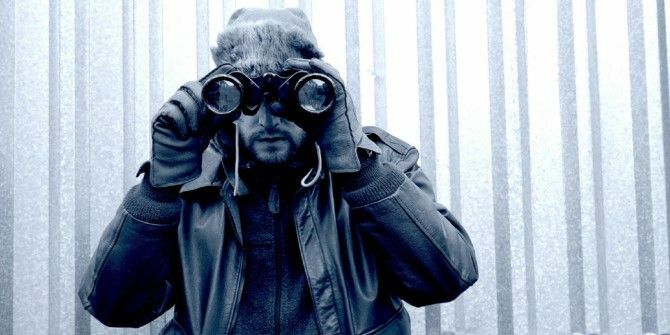 Could You Land A Job With The NSA? If you were to apply for a job at the NSA, would you be a successful recruit? What sort of questions do you reckon they'd ask during the interview? And would you know how to... Read More to see if you’re good enough for the NSA! Social networking is a risk to privacy. That’s the bottom line. But it’s also incredibly handy, and can even increase productivity 6 Unexpected Ways to Use Social Networks to Increase Your Productivity 6 Unexpected Ways to Use Social Networks to Increase Your Productivity Has your boss moved your desk a bit closer to his office? He knows you're Facebooking on the job. But you can use these networks to make your work life just a bit better. Read More . However, if you’re worried about Facebook, you can protect yourself How To Protect Yourself On Facebook How To Protect Yourself On Facebook Here's a list of do's and don'ts to keep yourself safe on Facebook. Read More , including playing with your app permissions Concerned About Privacy? Opt Out Of Facebook App Permissions With fPrivacy [Chrome] Concerned About Privacy? Opt Out Of Facebook App Permissions With fPrivacy [Chrome] I hate it when apps ask for permission to access my friends list, access my birthdate, and worse of all, post on Facebook as me. If you feel the same way Facebook apps and permissions,... Read More . The safest option – without cutting off your nose to spite your face – is to be aware, be careful, but continue to enjoy Facebook, Twitter and any other social media site as they were intended. Here's why I beg to differ with the assessment you thoughtfully supplied. I'm 69, hold two degrees in computer systems, one is network admin, and I grew up long years B4 both computers and Internet, and of course, cell phones. Maybe this is hard to swallow, but life without cell phones, computers, and Internet is far, far better in many key ways. The most important difference from B4 to now is security. B4 to access anyone's private data it was very, very, very difficult, if not impossible, and . . .
You actually were safe from government thugs, bankster thugs, street thugs, and all the other criminals in and out of government. Now, you tell me, when you lose all you have to any of the above thugs, just because you use cell phones, Internet, and computers, what do you plan to tell your wife, children, and other people you support? The bankster thugs and government thugs and street thugs have just one message they drill into your head - :It's safe to use OUR easy-to-brak-into-online-digital-services-network, SO DO IT! And "DO IT MORE! MORE! MORE!" Philip, this madness will stop, but not B4 hundreds of millions of private lives are destroyed. Either B-wise, or, B-fooled. It's that simple. I quit FB several months ago, and am in process of closing my YouTube account - permanently. Google, FaceBook, Twitter - et al, have no one concerned that some one is GOING to find a way to get YOUR most vital private data - online. Why take the 100% chance you will have your bank account exposed? It's a tough line to tread: you don't want to expose yourself unnecessarily, but then again, there's no point in shooting yourself in the foot and cutting yourself off. Frankly, there's no definite solution as a consumer! Don't forget Microsoft forces you to use Facebook if you want to use XBox Live too. Don't forget the facebook app also has permissions to read your text messages even though it's 100% not necessary! Bloody scum. I didn't know that! That certainly is suspect. I think this is a huge part of the problem: the majority of us live in ignorance of it all. I'm not saying we should constantly live in a state of suspicion, but we need all the facts before we come to any conclusions.